When do you need water flow in the home? When you want to get something wet, of course. If the sink is running and the water is flowing right down the drain, that’s called waste. Most household sinks have two valves or a single lever that determines flow rate and temperature. That requires reaching to turn the water on and off as you needs it. Not terribly inconvenient, but when your hands are full, such as when rinsing dishes, you might tend to leave the cold water run. There is a simple solution. Use your feet. I’ve been measuring water consumption, and trying to find ways to reduce it. When taking a 6.0 liter shower (which isn’t very much), a half liter here or there wasted to wash hands or rinse dishes, adds up over time. There’s also the fact that reaching back and forth to turn the water on and off at the sink spreads dirt, soap scum and disease. Meanwhile, I have these two feet I’m standing on, not doing anything. Foot pedal operated sinks aren’t new, they’re found in medical facilities, food processing facilities, and anywhere else sanitation is a concern. My purpose is primarily conservation and convenience. Foot pedal valves are available, but they are heavy, clunky, and hard to adapt to household use, other than a basement utility sink or the like. Worse yet, an RV is already limited in space, and “toe-in” style cabinets are not common due to height and volume limitations. The solution, I figured, was an electric valve with a foot operated switch. Water solenoid valves are commonly available (there’s probably one in your washing machine, dishwasher, or ice maker), and are relatively inexpensive. Common 120VAC or 12VDC coils can be found. The Squatch has a 12VDC power system, so this was the type of valve I purchased. I got some cheaper brass constructed valves from newegg.com, but even cheaper plastic versions would work equally as well. I simply adapted the valves to “push-fit” style fittings and spliced them into the cold water lines on both my kitchen sink and bathroom sink. A process that literally takes seconds. A couple of wires, an in line fuse, and a switch, is all it takes then. Any momentary switch will do. I chose a springy limit switch. The type used under the lid of high voltage equipment. They can prevent electrical shock when someone pulls a panel from a piece of equipment, the switch opens, and the equipment shuts down. They can also be used a type of position sensor in mechanical moving equipment to prevent it from operating outside of specific design conditions and possibly causing damage. My purpose was to simply wire it to be normally open, and when someone depresses the switch, it closes and energizes the solenoid coil. 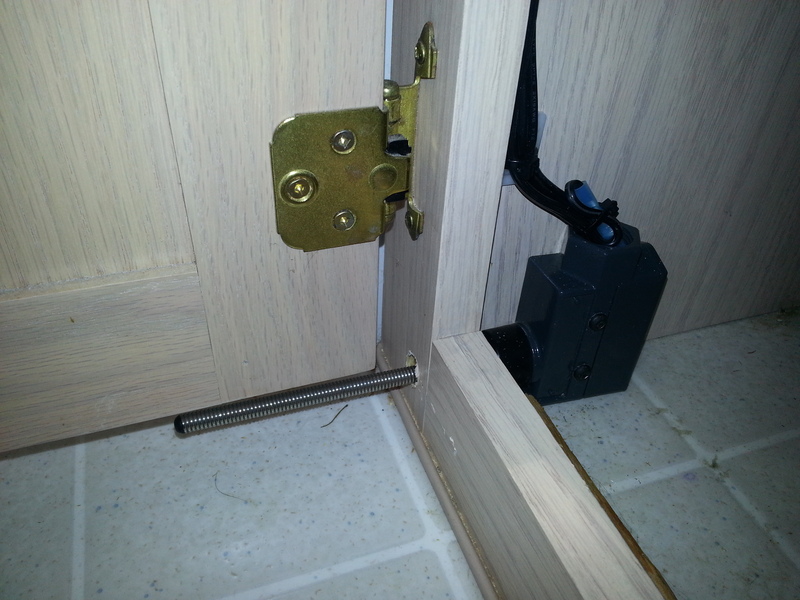 I mounted them inside the cabinets such that the spring lever protrudes through a drilled hole. Any kind of manipulation will activate the solenoid. Sort of a ‘mash pedal’. 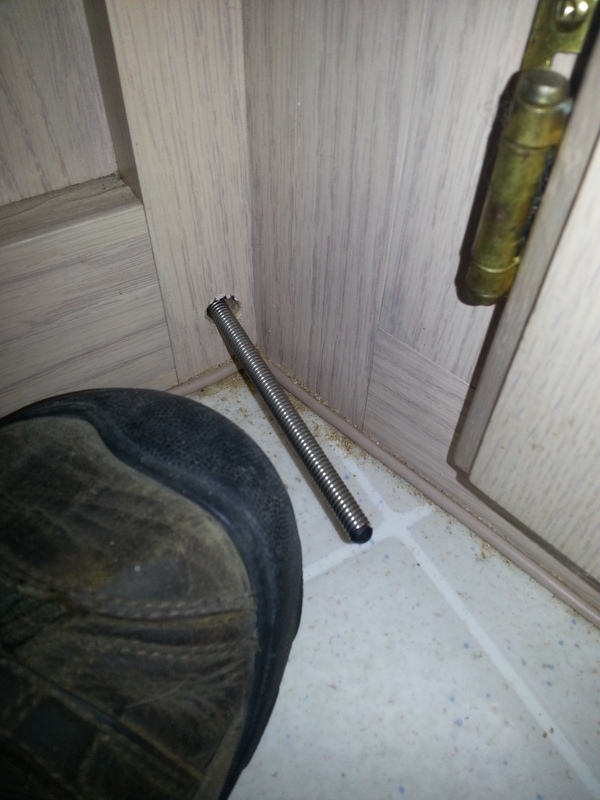 Unlike foot pedal valves, this is much harder to stub my toe on. I might find it too easy to step on, but it’s very much an experiment still. Why did I only valve the cold water side? Simplicity, for one. This is both a new installation, and a new behavior. I don’t want to make it confusing. If the cold water switch experiment were to fail, then having two switches would have been doubly disappointing. Another reason has to do with behavior. Cold water use is often used intermittently while hot water involves filling a pot, a sink well, or a shower. So a switch for the hot side isn’t really worth it, in my opinion. I did consider putting valves on both the hot and cold, controlled by a single foot switch. Control of temperature would be made at the faucet itself, with default being cold. Then I’d have to remember to turn off the hot and crack the cold on whenever I use the sink for anything other than cold water, and that sounds inconvenient and overcomplicated. Just a cold control is fine. There is great opportunity to conserve water in the shower by simply changing one’s behavior and adapting to a NAVY shower. Turning the shower water on and off must be made convenient and quick. Shutting off the water at the spigot (two separate valves), is inconvenient and takes time. I could replace the spigot with a single handle style mixing valve that pulls and pushes for activation, but I’d have to rig it so the shower hose diverter stays open. Inline shut offs do exist which is installed behind the shower head or shower wand, however, most of these are not positive shut offs, and leave a trickle of water. There are some positive shut offs available online, so I may go that route. Continuing with the shower, bypass solenoid valves would offer the opportunity to circulate water through the hot water line until the hot water made it’s way to the spigot, at which point the system returned to normal and a well tempered stream came from the shower head. A bypass valve or two with a pump, or two bypass valves that dumped pressurized water back into the storage tank, could save that half liter of water dumped down the drain while waiting for it to warm up. A low tech and certainly cheaper option is to simple catch the water from the spigot in a small basin, and use it for other purposes. In future homes, I will design the water heater to be so close to the shower that hot water will be available almost instantly. 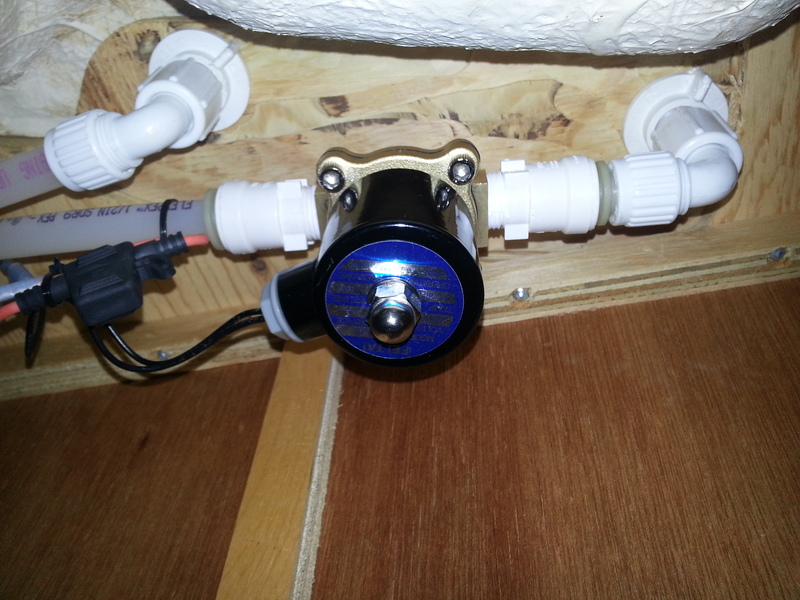 ‹ Water Meters Under the Sink!